For each visitor to our Web page, our Web server automatically recognizes only the visitor's domain name, but not the e-mail address (where possible). We collect the domain name of visitors to our Web page, the e-mail addresses of those who communicate with us via e-mail, the e-mail addresses of those who make postings to our chat areas, email addresses of both sender and receiver of those that send email via the website to another friend (collectively "send to friend pages"), aggregate information on what pages visitors access or visit, information volunteered by the visitor, such as survey information and/or site registrations. The information we collect is used for internal review to improve the content of our Web page, used to customize the content and/or layout of our page for each individual visitor, used to notify visitors about updates to our Web site, and marketing campaigns and not shared with other organizations for commercial purposes. We do, however, place advertisements, in the form of banner ads, on our site. These are companies or individuals that have sponsored the site or have made other arrangements with respect to advertising. The Dusty Armadillo does NOT endorse, make warranty to, recommend, or guarantee any content, service, or products of ANY sponsor or companies advertising on this site. All obligations, claims, and representation is solely on that of the sponsor or company advertising on this site. 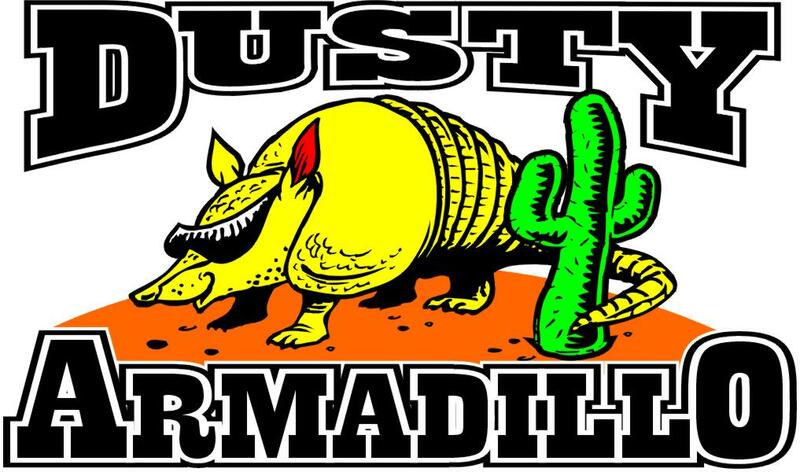 The Dusty Armadillo will not collect any personally identifiable information about you (e.g., your name, mailing address, telephone number or email address--except where noted above) through our websites unless you have provided it to us voluntarily. If you do not want your personal data collected, please do not submit it to us. We also, from time to time, send out email to our registered users. These mailers include, but are not limited to, special discounts to The Dusty Armadillo and news about The Dusty Armadillo or The Dusty Armadillo Website. We may also mail from time to time, our members, information or services that are provided by our sister or parent companies. WE WILL NEVER GIVE OR SELL YOUR EMAIL ADDRESS TO A THIRD PARTY COMPANY. If you do not want to receive e-mail from us in the future, please let us know by clicking here. As of April 21, 2000 the children's Online Privacy Protection Act became effective. The regulations apply to the online collection of personal information from children under the age of 13. The Dusty Armadillo is very sensitive to the issue of children's privacy and makes every effort to protect the privacy of children using the Internet. For more information please visit http://www.privacyalliance.org/kidsprivacy. Not to collect online contact information from a child under 13 without prior parental consent or direct parental notification of the nature and intended use of this information, which shall include an opportunity for the parent to prevent use of the information and participation in the activity. This online contact information shall only be used to directly respond to the child's request and shall not be used to recontact the child for other purposes without prior parental consent. Not to distribute to third parties any individually identifiable information collected from a child under 13 without prior parental consent. Not to give the ability to children under 13 to publicly post or otherwise distribute individually identifiable contact information without prior parental consent. Not to entice a child under 13 by the prospect of a special game, prize or other activity, to divulge more information than is needed to participate in that activity. Where appropriate, we will specifically instruct children not to submit such information on our websites and/or will take reasonable steps to ensure parental consent to such submission. The Dusty Armadillo takes pictures of all of our guests while at our establishments. These pictures are then reviewed and pictures that are appropriate will be posted on our website in the picture gallery for the club that they were taken from. By visiting the club, you are allowing us to take pictures that may be posted to this website without compensation or royalty of any kind. With respect to security: We always use industry-standard encryption technologies when transferring and receiving visitor data exchanged with our site. Visitors may prevent their information from being used for purposes other than those for which it was originally collected by calling us at the number provided above. If you feel that this site is not following its stated information policy, you may contact us at the above address, phone number, or email.